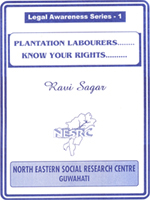 This booklet in English contains useful materials on the right to various facilities such as Drinking Water, Conservancy, Medical Facilities, Canteens, Creches, Recreational, Educational and Housing Facilities, Hours of work, Payment of wages, Daily intervals, Weekly Holidays, Prohibition on Employment, Leave with Wages, Sickness and Maternity benefits, Accidents and other facilities based on the Plantation Labour Act 1951 and The Assam Plantation Labour Rules, 1956. Author: Ravi Sagar, B.A., LL.B., DLL & LW. 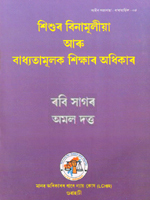 This booklet in Assamese contains useful materials on the right to various facilities such as Drinking Water, Conservancy, Medical Facilities, Canteens, Creches, Recreational, Educational and Housing Facilities, Hours of work, Payment of wages, Daily intervals, Weekly Holidays, Prohibition on Employment, Leave with Wages, Sickness and Maternity benefits, Accidents and other facilities based on the Plantation Labour Act 1951 and The Assam Plantation Labour Rules, 1956. This booklet in Hindi contains useful materials on the right to various facilities such as Drinking Water, Conservancy, Medical Facilities, Canteens, Creches, Recreational, Educational and Housing Facilities, Hours of work, Payment of wages, Daily intervals, Weekly Holidays, Prohibition on Employment, Leave with Wages, Sickness and Maternity benefits, Accidents and other facilities based on the Plantation Labour Act 1951 and The Assam Plantation Labour Rules, 1956. The Booklet on “Right to Information” is co-authored by Chandan Barman & Ravi Sagar which gives an insight into the effective use of the Right to Information Act 2005. The first part of the Booklet makes an attempt to answer certain basic questions pertaining to the Right to Information Act 2005 and its effective use by ordinary people in their daily living. It also highlights the use of RTI as the effective tool to stop corruption in public life and lists several areas where it can be used to reduce corruption. It provides model application for requesting information under Right to Information Act 2005 along with the model application format for the first appeal. 5 success stories are listed while using RTI Act 2005. Names and Addresses of the Central Information Commission and Information Commissions of the Northeast region are also given. The Booklet concludes with Bare Act of the Right to Information Act 2005 (Act 22 of 2005). Price: Rs.30; $ 1; EUro 1. Forest is the tribal habitat, their home and livelihood, centre of their culture, existence and survival. Over centuries they had developed a symbiotic relationship between their communities and forests but the forest management has not always respected their rights. However, today the forest dwellers are becoming aware of their rights. Because of it they are able to influence at least partially the National forest policy, 1988. There was a strong reaction also against their eviction all over India in 2002. They demanded that their right to shelter be recognized. The draft forest bill being prepared by the present Central Government is, therefore, meant to regularize their right to a house and land. Also the court judgments were the results of interventions by social activists and others communities. From this background a PIL (22/02) filed by Sri Jacob Marak and others against the State of Assam is discussed in detail in this booklet. 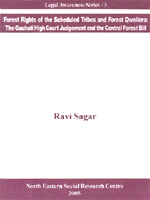 Tittle: Forest Rights of the Scheduled Tribes and Forest Dwellers: The Gauhati High Court Judgment and the Central Forest Bill. Price: Rs. 18.00; USD: 1.50; Euro: 1.50. Forest is the tribal habitat, their home and livelihood, centre of their culture, existence and survival. Over centuries there had developed a symbiotic relationship between their communities and forests but the forest management has not always respected their rights. However, today the forest dwellers are becoming aware of their rights. Because of it they were able to influence at least partially the National forest policy, 1988. There was strong reaction also against their eviction all over India in 2002. They demanded that their right to shelter be recognized. The draft forest bill being prepared by the present Central Government is, therefore, meant to regularize their right to a house and land. Also the court judgments were the results of interventions by social activists and others communities. From this background a PIL (22/02) filed by Sri. 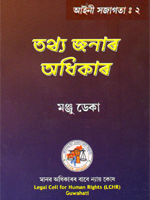 Jacob Marak and others against the State of Assam is discussed in detail in this booklet. Author:Ravi Sagar, B.A., LL.B., DLL & LW. This booklet in Assamese “Sishur Binamulia aru Baddhyatamulak Sikshar Adhikar Aain” is co-authored by Ravi Sagar and Amal Dutta which describes that every child between the ages of 6 to 14 years in India has a fundamental right to education. The first part of the booklet makes an attempt to answer certain frequent and basic questions pertaining to the Right of Children to Free and Compulsory Education Act, 2009. It also highlight the duties and responsibilities of State, parents/Guardians, Teachers, Local authorities and civil society. 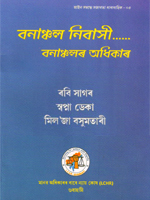 At the end this Booklet contains the Right to Education act, 2009 and also the Assam State’s Rules. Tittle: The Right of Children to Free and Compulsory Education Act, 2009. Author: Ravi Sagar & Amal Dutta. Forest dwellers preserve the forest of the country. Yet the, they have been evicted either on the ground that they have illegally occupied it or they destroy the flora and fauna of the forest. Forceful eviction of forest dwellers from the forest is a major issue in recent times. To protect them and to recognize their forest rights, Parliament of India has enacted “The Schedule Tribes & Other Traditional Forest Dwellers (Recognition of Forest Rights) Act, 2006. 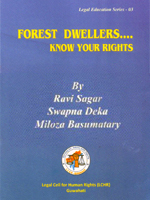 The booklet in English “Forest Dwellers-Know Your Rights” is co-authored by Ravi Sagar, Swapna Deka and Miloza Basumatary which gives an insight of the various rights of the forest dwellers based on “The Schedule Tribes & Other Traditional Forest Dwellers (Recognition of Forest Rights) Act, 2006.